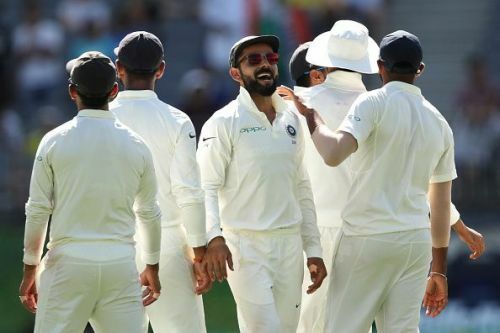 Australia vs India 2018-19: Has Virat Kohli played his best XI for the 2nd Test? After a historic Test victory at Adelaide, India are certainly eyeing a maiden series victory in Australia. The squad India possess is in form, and capable of performing well overseas. Moreover, the Australian side in this series is not necessarily the strongest they've put together in recent times. Relatively inexperienced at the Test level, the hosts have been widely expected to face a stiff challenge from the No. 1 Test side in the world. However, Virat Kohli may have missed a trick while selecting the playing XI for the second Test at Perth. Due to injuries, Rohit Sharma and R Ashwin were replaced in the XI by Hanuma Vihari and Umesh Yadav respectively. That means India are playing four fast bowlers and no specialist spinner. Vihari replacing Rohit was what everybody expected. But most people would've spontaneously picked Ravindra Jadeja for Ashwin. And if you had to go with four pacers, Bhuvneshwar Kumar was the most compelling choice; the fact that Kohli picked Umesh instead, left many people perplexed. The idea of playing Umesh is not wrong. The Perth deck was looking helpful for the pacers, and by having one more hit-the-deck type of bowler, you increase the chances of putting pressure on the opposition. Moreover, Umesh has a good record at Perth, having taken a 5-for in the only Test innings he has played in the city, which of course was on the W.A.C.A ground. But there are a few more things to consider while playing at Perth. Being an unpolluted, isolated city, and also being very close to the ozone depletion area, the sun burns the skin here. The sun is hotter, brighter and carries the dangerous UV rays. When you play four fast bowlers, you need to give them ample rest time as well. Kudos to Vihari, who not only did that duty on the first day, but grabbed two wickets as well. But that did raise another question: what if a specialist spinner was playing? For India, it's a chance of being 2-0 up and ending the possibility of a series loss. But Australia will also see this as their chance of wearing out the Indian fast bowlers before the third and fourth Tests. And with Ishant Sharma getting abdominal muscle cramps today, the risks for India have been compounded further. Did Kohli play his best XI? That question is up for debate until the match ends.